I think, I'd have to say that Fall is my favourite season. I like the cooler weather- cooler, not freeze or bits off, ice and snow- and the coziness that the shorter days and longer evenings bring. So when I spotted a Fall Edit tag I thought it might be fun to do. 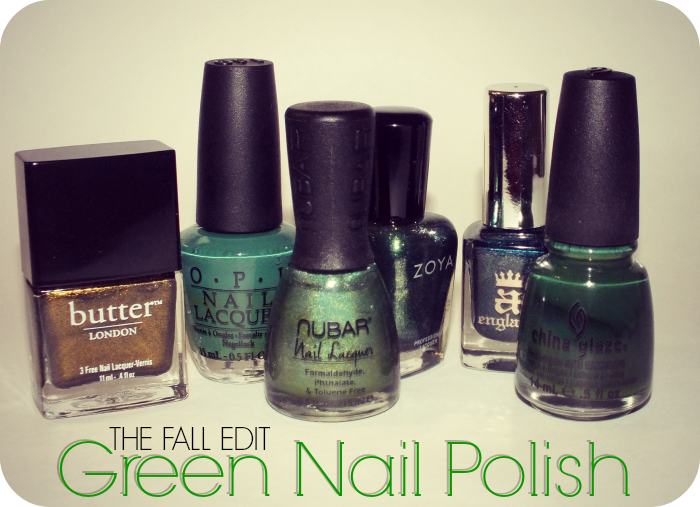 Day one of the Fall Edit brings us green nail polish. Read on to see my picks! 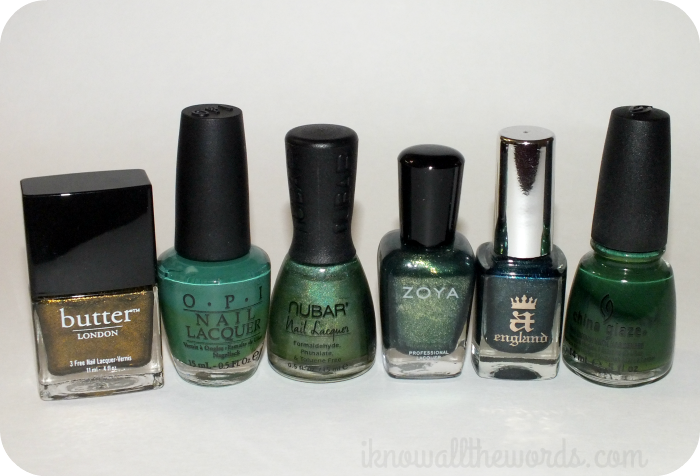 You know I love nail polish, and I also happen to love green, so the task of choosing a reasonable number of Fall appropriate green shades was tough. I ended up with six that are all gorgeous, and should provide something for everyone. Wallis is a golden olive green. It's shimmery and shiny and flat out amazing. I'd say this is my favourite Butter London polish. Jade is the New Black is a dusty blue based green. This is one of the first OPI polishes to join my collection and it's still one of my favourites. ReClaim is a medium green linear holo that flashes shades of teal, blue and gold. This does shift really nicely, but you do have to be in the right light- which I was not when I took photos. A gorgeous effect though, and a must have for holo fans. Logan is a deep hunter green that is loaded with silver and gold. This is such a gorgeous shade as it flares and shifts in the light. Saint George is a deep teal with scattered holo. I know, teal isn't green, but it's close enough right? I think anyone would bend the rules a little for an A England holo as they are pretty outstanding. 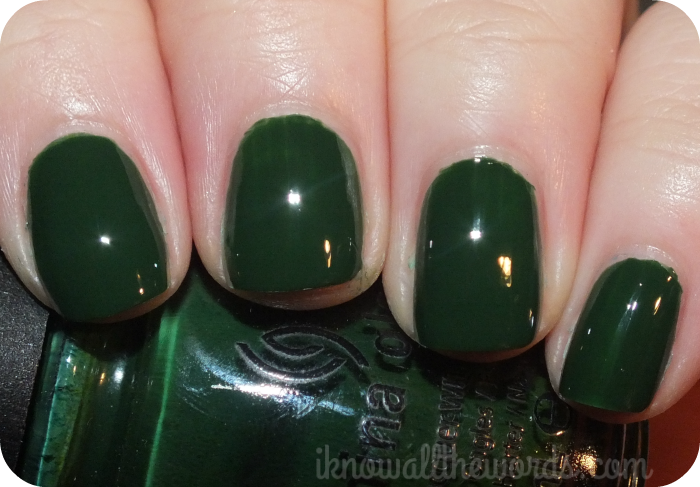 Holly Day is a deep hunter green cream. I absolutely love this shade. Although it's from a Christmas/ Holiday collection, I wear this shade all year round. It's deep and gorgeous! 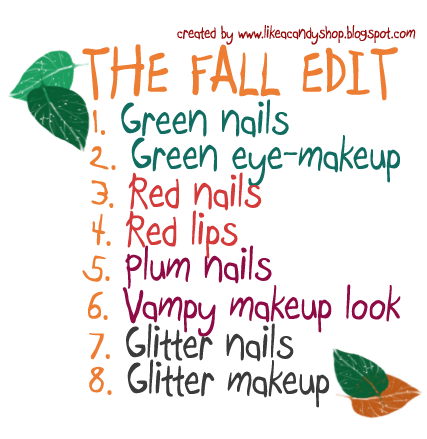 I can't take credit for the Fall Edit tag as it was created by Elsa from Like a Candy Shop. Be sure to check out her blog if you're not already reading and of course, check out her Fall Edit posts. I've included the tag above if you'd like to join in. Let me know if you do, I'd love to see your pick! 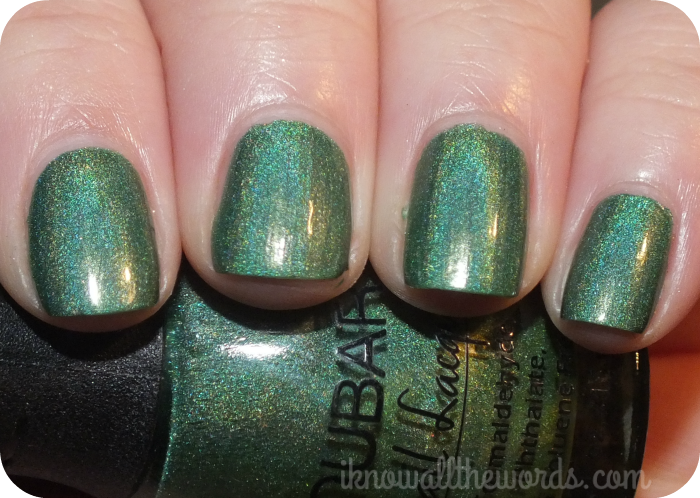 What are your favourite green polishes for fall?